Laurence Payot and Art Reach and currently developing a new project that will send positive messages about Refugees and Asylum Seekers, to change perceptions and celebrate the hopes, aspirations, and resilience of displaced people. Angels from the Seas will celebrate the courage and bravery of displaced people, and give them a platform to share their dreams for the future. It will focus on the amazing strength and resilience of those who have left everything behind in pursute of hope, aspiring to a better life for themselves, for their family, for their country, for a better-united world. These stories of diplacement are the tip of the iceberg of a deep world-wide problem which we should all feel more involved with. As an example, the Syrian refugee crisis is one of the biggest migrations in history. Over half of the country’s pre-war population have been forced to flee their homes since the outbreak of the conflict in 2011, when a government crackdown on peaceful protests turned into a full-scale civil war. If anyone can start giving answers – or opening up new questions – about our current world crisis it may well be the people who are displaced, the ones who can see the bigger picture, the ones who are at the heart of it all. Angels from the Seas will engage with Asylum Seekers and Refugees across the UK. Working with Art Reach and with partner organisations in Leicester, Manchester, Portmouth and with cities of Sanctuary across the UK, it will reach diverse groups of participants through engaging workshop sessions. The final outcome will be a series of huge video portraits projected on buildings in city or suburban areas, or on trees and natural landscapes in parks. It will consist of a mobile projection system traveling easily to unexpected locations, reaching new audiences. The projections will firstly be presented near the areas where the work was created, to show the participants what they have created. It will then tour to Journeys International Festival in Leicester, Plymouth and Manchester. Working with Cities of Sanctuary across the UK, the project will then tour to other cities. As the work travels to new places, we will be able to connect with new organizations along the way, meet new Refugees and Asylum Seekers and grow the archive of video portraits for future presentations. A specially designed mobile video booth on wheels will travel around the streets and/or visit specific groups. People will be invited to engage in conversations about their personal stories and hopes, which will then be recorded via video portraits to be used for the public projections. The artist working with the groups and individuals will use engaging techniques to generate ideas and content, such as drawing and mind mapping, presenting people with images and facts as starting points, facilitating group discussions or generating intimate exchanges. She will work with translators to make the sessions as accessible as possible. People’s thoughts will be recorded visually through close up video portraits, making the film intimate and personal, giving importance and significance to each person taking part. The video portraits will be recorded in front of a black backdrop; When projected, the black backdrop will disappear, making the portraits appear angelic and merging with the surrounding landscape. The mobile nature of the video booth will allow us to reach people more easily by coming to them rather than except them to come to us. Some people may want to take part but outside of the walls of an institution so we could meet them in the place of their choice, where they feel at ease. Things that may be discussed are: What does it take to leave everything behind and step into the unknown? What are the coping strategies, stories of resilience, to deal with harsh situations, when it feels like all the doors are closed? Who are these displaced people, what makes them laugh, what makes them happy, what do they dream of? What can we learn from them? How can we be more humble, how can we listen more, be more understanding? Who are the people who care, who help and foster these new lives that become part of our community? As the work tours to new places, so will the photo booth, in order to welcome more voices to be heard. At dusk, the video portraits will be projected on urban, suburban, or more rural landscapes, like angelic and ephemeral apparitions. Each new presentation of the work will have a different aesthetic. The artist will work with each host organization/festival/gallery to define the most relevant sites for the projections. 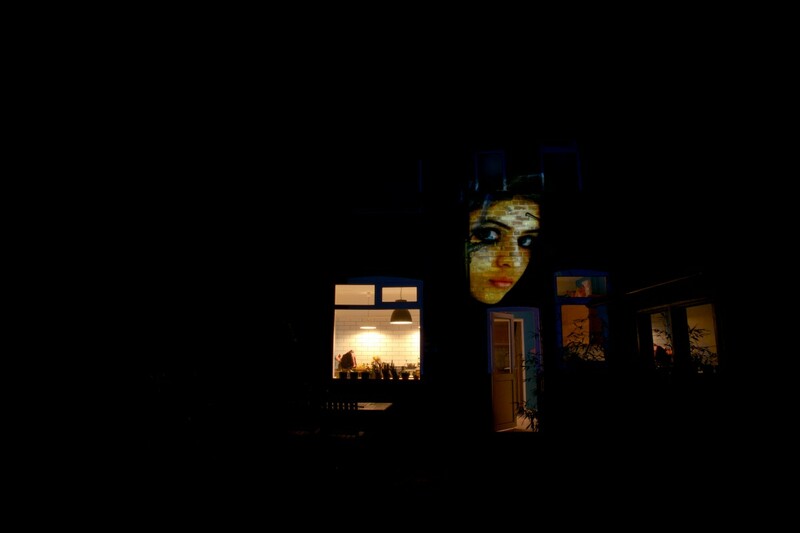 At times it may be presented in very busy city centre streets, other times, it may become a more intimate experience, projected in a small quiet street, somewhere were people would not expect to see it. Projected on uneven surfaces, the portraits appear as abstract splashes of colour until the viewer faces the projection front on, giving it a mysterious element of discovery. (see images above). A specially designed wooden structure on wheels will host a generator, a projector and two bluetooth speakers, making the system simple, self-sufficient and mobile. The projector we will use will be of 5000 lumens, and with enough quality to project on most medium size buildings. Having two bluetooth speakers will allow us to place the speakers in the best possible locations in response to the site without the need for cables. Thanks to being a mobile structure, it will have the ability to move to various sites and create a real event, like a trail to follow. The projections will be in continuous movement, panning across buildings, street furniture, trees and people. At times, the projection may stop on a building to generate interest and curiosity, to gather strangers together and spark new discussions. For each event/presentation, we will welcome local organizations or charities working with refugees to use the event as a way to promote what they do.